PAYSON -- Donald Cox calls his Payson greenhouse operation "Paul Bunyan Gardens," and with good reason. He "tops" his tomato plants when they reach 8 feet tall. The leaves are the size of a large man's hand, and the plants produce an abundance of organic, perfectly formed fruit 12 months of the year. Cox says he once grew a tomato plant 18 feet tall. Currently, he has 3,000 plants, which he planted May 20. He started picking tomatoes in half the time it would take ordinarily. 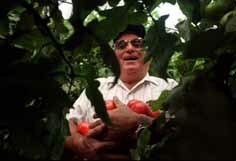 "I pick from 300 to 600 pounds of tomatoes per day from those vines," Cox says. He also grows a variety of sweet and hot peppers, and Cox says he accomplishes all this with a trademarked growing method known as Sonic Bloom, a patented process developed by Dan Carlson Scientific Enterprises Inc. in Minnesota. Carlson's system uses a combination of growth-stimulating sound emitted at certain frequencies and an organic growth formula that is applied to the leaves of plants. Carlson -- who visited Cox's greenhouses last week to see his system in action -- says "not only is production increased, but the fruits have more nutrients and the tomatoes have a longer shelf life." Utah State University tested some of his tomatoes, Carlson said, and found that while most varieties have 4 or 5 percent sugar content, the Sonic Bloom tomatoes have 6 percent. Cox also uses a heating system that benefits his greenhouses. In 1990 he developed a process of burning used tires without emissions. He built the machinery to clean up oil spills using the heat from burning tires to separate oil from the soil. It was used by Exxon at Chalk Creek, Wyo., near the Utah border. They processed about 300,000 yards of oil-contaminated soil and reclaimed most of the oil. "The company liked the process, but decided to use natural gas for heat because they could obtain it free," Cox said. "I needed to find something to do with the tire burner, so I decided to build some greenhouses and heat them with the tire-burning machinery. It's non-toxic and non-polluting." Cox's Payson greenhouses have hot-water pipes underneath to heat the floors. At zero degrees outside, the tire-powered heaters keep the greenhouses a toasty 85 degrees inside.